It is the trip of a lifetime for a local lacrosse player, who has been identified to attend a camp in Baltimore, Maryland in July. Alex Bremner, who is 14 and attending Willow Creek Composite High School, received an e-mail a few months ago inviting him to the Maryland Lacrosse Showcase. “I was super shocked,” he said of his reaction when learning about the showcase. At first he wasn’t sure if he could do it, but he has been training. “I’m still a bit nervous, but I think I’m ready,” he said. His selection came as a bit of a surprise. “They scouted him at one of the many games he played last year,” said Mellissa Bremner, Alex’s mother. 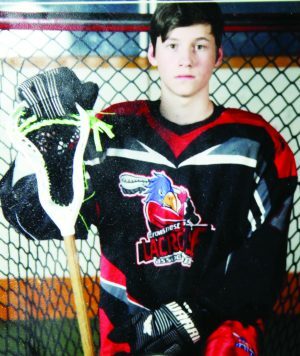 He was part of three teams last year – the Claresholm Rockmen; Crowsnest Pass Ravens; and a Southern Alberta Lacrosse Association team. Bremner will be playing midget lacrosse when he heads to Baltimore for the showcase on July 27 and 28. Players will train then be divided into teams where they will play at least five games. More than 90 college coaches and recruiters will also be present. Alex is entering his eighth year of lacrosse. Because there is no midget team in Claresholm this year, he is playing in the Crowsnest Pass. There is a lot he loves about lacrosse. Although not playing in Claresholm, he will be assisting coach Lyle Franz with various age levels in Claresholm. Alex is also fundraising for the trip to Baltimore to cover the costs of everything from flying and renting a car to a hotel. He has been doing odd jobs and has more lined up such as vehicle detailing and babysitting, and is always looking for more. He is a quick learner, hard worker, eager to please, and always willing to help out. Anyone interested in helping out or hiring Alex can e-mail mellissabremner@gmail.com (no dashes or spaces).